The selection of members is accomplished through the Committee on Directorship with recommendation to the membership for vote. The Board of Directors are full time volunteers committed to upholding the highest standards of ethics and conduct and promoting a culture of service through volunteerism, ethics, and effectiveness throughout the organization. 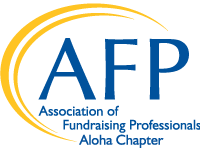 As a 501(c)(3) public charity, the Association of Fundraising Professionals relies upon the support of generous supporters to fulfill its mission.